Taste Your Way Around The World With the Leeds Food & Flavours Festival! Get ready for a unique culinary experience! The wonderful diverse communities of Leeds invite you to sample tastings of their delicious traditional recipes and exchange cultural dialogue. There will be East African, Greek, Gujarati, Jewish, Lithuanian, Punjabi, Thai, Cameroon and Zimbabwean foods on offer just to name but a few. This winter tasting festival not only offers mouth-watering bites, but a range of live cooking demonstrations, live cultural arts performances and family fun. There will also be local producers selling scrumptious goodies too, so you will be sure not to go away hungry. This celebration of vegetarian and fish based international cuisine will be held on Sunday 18th February, 11.30am – 4.30pm at St Edmunds Church Halls, Lidgett Park Road, Roundhay, LS8 1JN. Tickets are £5 and are available from Eventbrite on Leeds Food & Flavours Festival or from Makor. Children are very welcome at a cost of £3 at the door. For further details contact 0113 2680899, or email info@makor.co.uk. The Leeds Food & Flavours Festival is funded by the National Lottery through the Big Lottery Fund in addition to Near Neighbours. Makor Charitable Trust has partnered with St. Edmunds Church to facilitate this event. Internationally Renowned Sculptor, Frances Segelman, will sculpt bust of Arek Hersh, Leeds Holocaust Survivor, live, Sunday October 1st, 2pm at the MAZCC, 311 Stonegate Road, Leeds. Sculptor to the Royals and personalities from the world of entertainment, politics and sport, Frances Segelman, will create a live sculpture of Holocaust survivor, Arek Hersh, in Leeds on 1st October 2017. Frances’ recent commissions include Her Majesty the Queen, HRH The Duke of Kent, Boris Johnson, Joanna Lumley, Lord Julian Fellowes, Sir Derek Jacobi, Sir Steven Redgrave and Sergei Polunin. A special art exhibition of local and professional artists and photographers to include Jonathan Straight, Barry Henson, Philip Naviasky and Joash Woodrow, on the theme of ‘Survival and Memories’, will be on display in addition to London artist, Victoria Perloff. Many of these works will be sold on the day in a secret auction. Bonhams Auctioneers will be at the event and invite you to bring your paintings and sculptures from 1.45pm – 4pm to be valued. Self-taught Frances Segelman has risen to the top of her profession having sculpted a wide variety of public figures including HM The Queen, HRH The Duke of Edinburgh and HRH The Prince of Wales. Frances Segelman is a Fellow of the Royal Society of Arts, an Associate of the Royal Society of British Sculptors and a Liveryman of the Painters and Stainers Livery Company. With Chazan Albi Chait and the UHC choir, the Zone’s film about Holocaust denial, the HSFA, and with community members and dignitaries, we focus on bravery and heroism, and say loud and clear “Never again”. Based on experiences and stories from people in our own community, and telling a true story from the Yom Kippur war, we focus on how Yom Hazikaron affect all of us, in Israel and in Britain. With Shira Colombick, our Shinshinit Daria, and your friends in Leeds sharing their personal stories. Plenty of activities for youth lead by our community’s Zionist youth movements; clowns and jugglers; fun photo booth and Israeli Falafel dinner! Amazing Israeli band; message from the Israeli Embassy; the Brodetsky choir; Daria’s Brodetsky dance group; and loads of laughs with our host. Following a successful two week run in London, KNOCK KNOCK arrives to Leeds on 16th March as part of the JFest International Season. Niv Petel’s stunning solo show draws back the thick curtain of politics in the Middle East to celebrate the life, laughter, joy and love of a mother and her only son, in a place where every child is duty bound to become a soldier and every parent has an army uniform in the attic. This accomplished young actor skillfully metamorphosises into the role of a mother in Israel working as a liaison officer for the Israeli army, supporting families who’ve lost their sons to the wars. She is naturally chatty and excitable when around her son. She has a friend and neighbour, but her closest relationship is with her son. She spoils him and treats him with outrageous affection, giggling at his jokes and trying to remain in his good favour. Yet the spectre of the military looms large – all boys must serve when they are of age – and it is in her desperate attempts to prevent him from entering a combat unit where conflict emerges. As her son grows up, the little family’s happiness is increasingly disrupted by an imposing future – in a society where a knock at the door can only mean one thing. KNOCK KNOCK is inspired by real events and tells a story about parenthood, friendship, love and sacrifice. 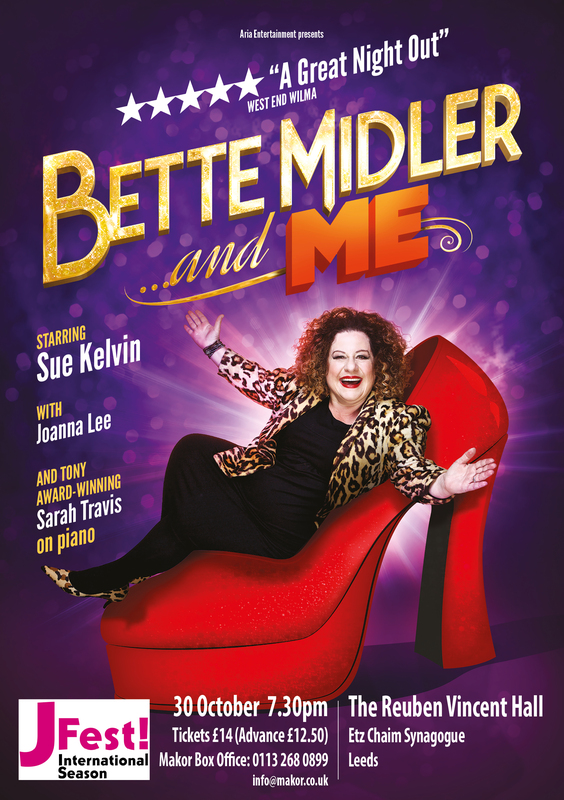 Following rave reviews, celebrated West End Star, Sue Kelvin, stars in a thrilling show about how Bette Midler’s music inspired and influenced her throughout her career. Expect to hear massive hits, lively banter and a roller coaster ride of a musical! Advance discounted tickets £12.50 from Makor Box Office: 0113 2680899/info@makor.co.uk or £14 on the door. 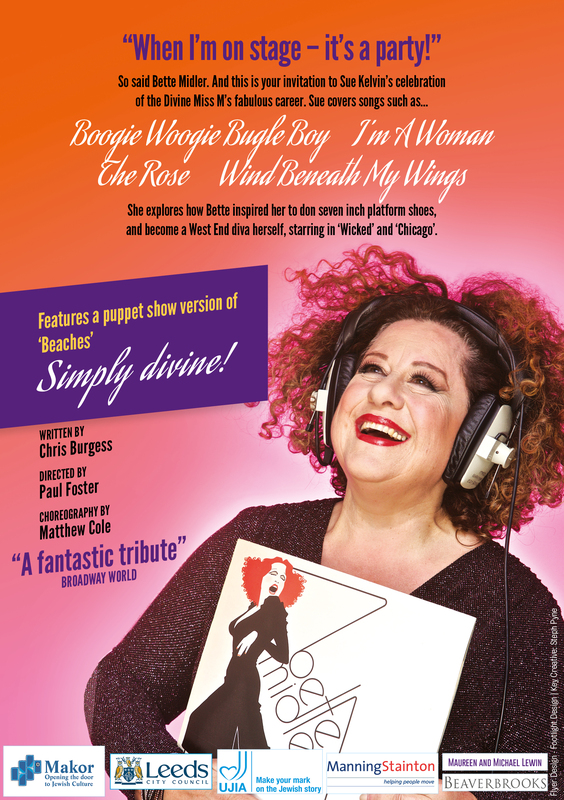 A Variety Show with the Wow Factor! Don’t miss this cultural spectacular.